Diudea, M., Nagy, K., Pop, M., Gholami-Nezhaad, F., Ashrafi, A. (2010). Omega and PIv Polynomial in Dyck Graph-like Z(8)-Unit Networks. International Journal of Nanoscience and Nanotechnology, 6(2), 97-103. Mircea V. Diudea; Katalin Nagy; Monica L. Pop; F. Gholami-Nezhaad; A. R. Ashrafi. "Omega and PIv Polynomial in Dyck Graph-like Z(8)-Unit Networks". 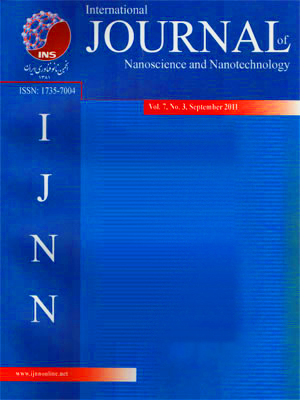 International Journal of Nanoscience and Nanotechnology, 6, 2, 2010, 97-103. Diudea, M., Nagy, K., Pop, M., Gholami-Nezhaad, F., Ashrafi, A. (2010). 'Omega and PIv Polynomial in Dyck Graph-like Z(8)-Unit Networks', International Journal of Nanoscience and Nanotechnology, 6(2), pp. 97-103. Diudea, M., Nagy, K., Pop, M., Gholami-Nezhaad, F., Ashrafi, A. Omega and PIv Polynomial in Dyck Graph-like Z(8)-Unit Networks. International Journal of Nanoscience and Nanotechnology, 2010; 6(2): 97-103. Design of crystal-like lattices can be achieved by using some net operations. Hypothetical networks, thus obtained, can be characterized in their topology by various counting polynomials and topological indices derived from them. The networks herein presented are related to the Dyck graph and described in terms of Omega polynomial and PIv polynomials.